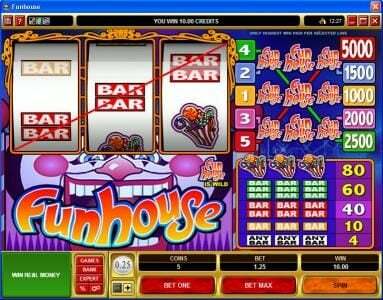 FunHouse online slot machine pictures and slot feature list from Microgaming, play FunHouse Slots for free. FunHouse Slots has not been reviewed yet, be the first to rate this slot. 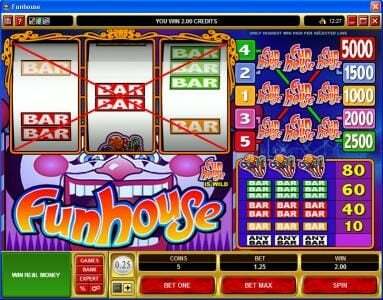 Funhouse is a 3 3eel, 5 payline classic slot game that has been developed by Microgaming. This game has a wild symbol and there is also a maximum jackpot that is worth up to $25,000. The software developers of this game have opted to just have two themed slot symbols in this game. Those slot symbols being the fun house logo and a box of candy. The remaining slot symbols have been designed around classic slot symbols like a single bar, two bars and three bars. The sound effects for this game are enjoyable. This game pushes the standards for the sound effects that we listen to while we are playing this slot games. You will sometimes hear a laughing clown or a clown whooping and hollering. You will be able to wager $0.25, $0.50, $1, $2 or $5 in Euro's, Pounds or Dollars. This will allow mid-range rolling players and low range rolling players to play this game. You will only have to wager a small amount of money even at the maximum and you will still have the potential to win a large amount of money. You also can use the automatic spin options when you enter the expert mode. The wild symbol in Funhouse is the Funhouse logo symbol. This game will pay five top prizes when three of the symbols appear on the reels in the game. The paylines must be activated for the wild symbols to trigger. This will allow you to win a good amount of money in the game and it will add a large amount to your payroll. This is one of the most spectacular Slot games we have ever played from Microgaming. The game sticks to its funhouse name because the game is loads of fun to play. We recommend this game to all of the viewers of our website.